Karim Habib says Montreal "shaped who I am." Thirty years ago, Nissan’s luxury brand Infiniti was born on the floor of the North American International Auto Show in Detroit. 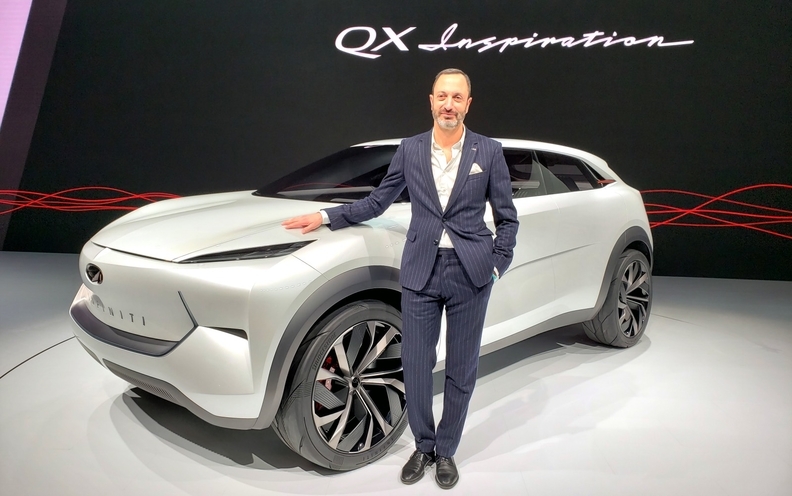 To mark the occasion, the brand’s executive design director, Montreal-raised Karim Habib, presented the QX Inspiration electric crossover concept as the company announced its intention to electrify the powertrain in every car it sells from 2021 onward. As a Lebanese-born Canadian tasked with stewarding the design direction of a brand seeking to embody the Japanese expression of luxury, Habib is in a unique position. But he looks to his time growing up in Montreal as giving him a strong foundation for learning the intricacies of another culture. Habib has lived in Tokyo for a year and a half, and in that time he has observed several aspects of the Japanese aesthetic and way of life that have influenced his automotive design direction. One concept that has given Habib guidance is that of omotenashi, a term that for the unique Japanese approach to hospitality. “We rediscovered a book that we had from the original Q45,” he said. “We were reading it in the studio, and it's really about the ability to treat the customer in a way that shows respect and that's a giving way. “That's obviously not directly related to design, but if you see the [QX Inspiration], the doors open in both directions and we don't have a B-pillar. We do that as a symbol for that openness. The upcoming era of electrification has provided a clean slate in some ways for interior design, an advantage that Habib says his design team capitalized on in the QX Inspiration concept. “One of the things that's very restrictive in interiors often is the HVAC unit. It’s actually quite big, and having that HVAC unit in the middle of your dashboard determines how your dashboard is. “If you don't have an engine, you're technically able to put that HVAC in the engine compartment, and suddenly your dashboard changes completely. I think that's great. You don't have a tunnel. Being able to have a flat floor and slide from side to side is something that I think is really important. “We purposely took away all the volume below the dashboard to make it feel almost like a table that's suspended quite high. That same spirit of a high, very thin dash, these are things we can do in production. Those are things that are more of a revolution.